Rooms from $38.39 per night. 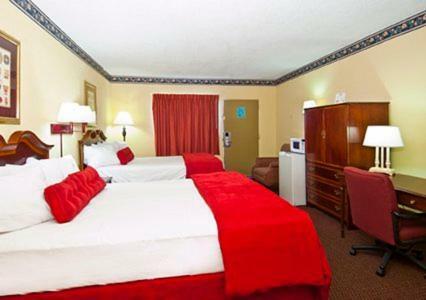 With complimentary Wi-Fi free continental breakfast rooms with microwaves and mini-fridges and a location just minutes from downtown Macon attractions the pet-friendly Econo Lodge Macon offers all the basics that our guests need for a convenient budget-friendly stay. The two-floor Econo Lodge features 39 rooms (non-smoking available) featuring free Wi-Fi and local calls microwaves and mini-fridges and cable TV with HBO and ESPN. Some rooms offer separate seating areas and jetted tubs. Pets under 25 pounds are welcome for an additional fee. Before heading out for a day of work or sightseeing guests can fill up on a complimentary continental breakfast. A handy laundry room and copy and fax services are welcome time-savers. Free parking includes room for buses and trucks. 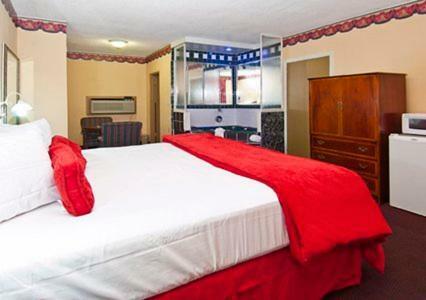 Right off I-75 the Econo Lodge enjoys a central location near Macon area attractions. The downtown business district is just three minutes away. The Macon Centreplex is under a mile. Mercer University and the Tubman African American Museum are both five minutes and shopping at the Macon Mall and Eisenhower Crossing is about 15 minutes. Middle Georgia Regional Airport is 12 miles from the hotel. Add Econo Lodge Macon to your free online travel itinerary.